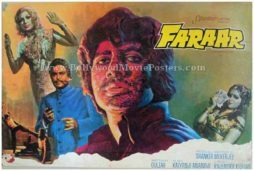 Old hand painted Bollywood movie show card of the Hindi film, Faraar (1975) for sale. This is an actual surviving old Bollywood show card of the 1975 Hindi film that featured the greatest superstar of Indian cinema, Amitabh Bachchan in the lead role. Printed and circulated a few years after the first release of the film (late 1970s), this original vintage Bollywood movie show card was designed and printed for publicity of the film inside a cinema hall. Showcards were used as pin ups on notice boards inside foyers of cinema halls. Printed on photo paper, they were often mounted on cardboard to make them easy to display. This rare surviving Amitabh Bachchan show card was actually issued to a cinema hall that screened the film Faraar, making it highly collectible! 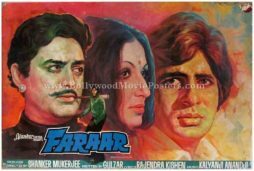 This old Bollywood show card was originally designed on a canvas board in hand painted format by the greatest and most expensive Bollywood poster artist of all time, Diwakar Karkare (owner of Studio Diwakar). This beautiful hand painted Bollywood show card displays his signature flair and mastery over the paint brush. The artwork features stunning hand painted portraits of the three lead actors – Amitabh Bachchan, Sanjeev Kumar and Sharmila Tagore. The expert brush strokes master Bollywood poster artist Diwakar have been captured brilliantly in this vintage Bollywood show card.